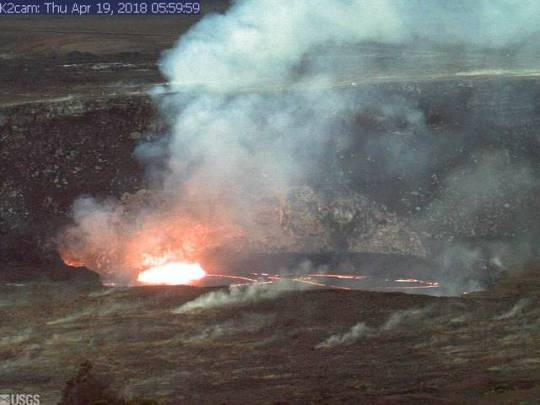 Observations and measurements of the Pu‘u ‘Ō‘ō eruption on Kīlauea Volcano’s East Rift Zone during the past month suggest that the magma system beneath Pu‘u ‘Ō‘ō has become increasingly pressurized, the Hawaiian Volcano Observatory reported April 17. If this activity continues, a new vent could form at any time, either on the Pu‘u ‘Ō‘ō cone or along adjacent areas of the East Rift Zone, it added. Summit tiltmeters recorded deflationary tilt over the past 24 hours, leveling off earlier this morning, HVO said April 18. The summit lava lake level is about 20 m (66 feet) below the rim of the Overlook crater, a drop of about 7 m (23 feet) since yesterday morning. Lava spattering is barely visible from the Jaggar Museum at this time. Seismicity in the summit area is within normal, background rates, with tremor amplitude fluctuations associated with lava lake spattering. Elevated summit sulfur dioxide emission rates persist. The Pu‘u ‘Ō‘ō eruption continues to supply lava to the 61g flow and the lava pond within the Pu‘u ‘Ō‘ō crater. 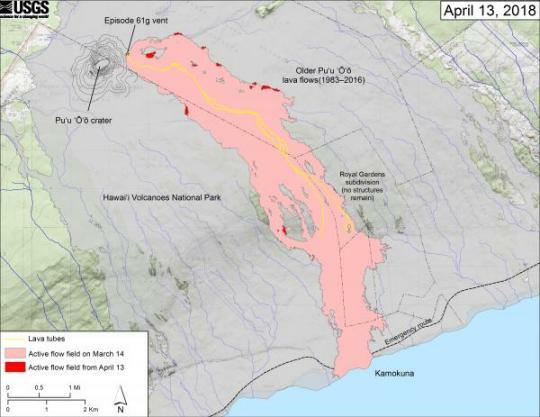 As of April 13, 2018, geologists observed scattered breakouts from the 61g flow within about 2.2 km (1.4 miles) from Pu‘u ‘Ō‘ō and a sluggish breakout about 5 km (3.1 miles) from Pu‘u ‘Ō‘ō. During the past few weeks, lava flows have also erupted onto the Pu‘u ‘Ō‘ō crater floor.